Have you unlocked Jedi Knight Revan and looking to share your vast knowledge of this Old Republic hero with the community? Are you a newer player who would like to borrow a really strong Jedi Knight Revan to use on the Light Side, Cantina, Mod Battle or challenge holo-tables? 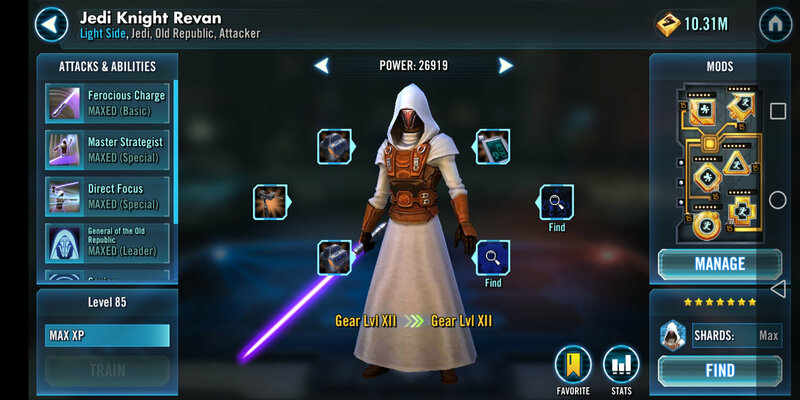 Are you an older player who did not unlock Jedi Knight Revan but want to test him out? Here, veteran players with Jedi Knight Revan can post their ally codes, allowing players who do not have Revan to become allies with them and borrow him! > Post your ally code if your willing to share your Jedi Knight Revan with the community! Currently G12 with 3 zetas. Available to use in light side battles, cantina battles and mod battles. Currently gear 12 with one 12+ piece and all 3 zeta's. I have him set in light side battles, cantina battles, mod battles and galactic war. Edit: will check back every once in a while, but I am full. I will remove people who aren't active for a couple days and add my code back in. Currently full cant figure out how to delete post. 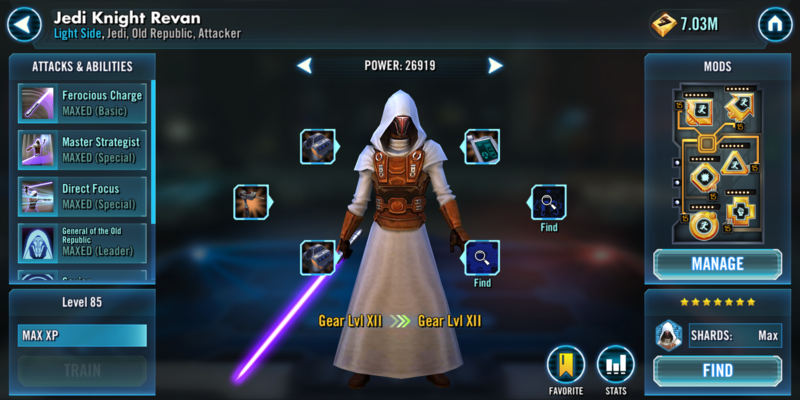 G12+ Revan with all 3 zetas and all gear slots filled. Should be set as the leader in LS, cantina, and mod battles. UPDATE 12/17/18: Ally list full again. Will remove any allies inactive for a day or more to make room for active players. My allies are full again. If any slots open up, I'll post again! I’m full and have way too many pending requests so removing ally code for now, will add back as any space clears up! Aww, you guys are so nice! I don't want to take up space but next time revan comes ill put my code here, so look out for that! Managed for about 6 months but done for now. Each day I delete any allies that hit 10hr+ no activity to make room for new people. Light Side, Mod, and Cantina Battles. Full right now. I'll repost if a spot opens. (Deleted ally code — I’m full up now). Sorry, I thought I did this a few days ago, but it didn’t take. Helped where I could. All full! I have 6 spots open. 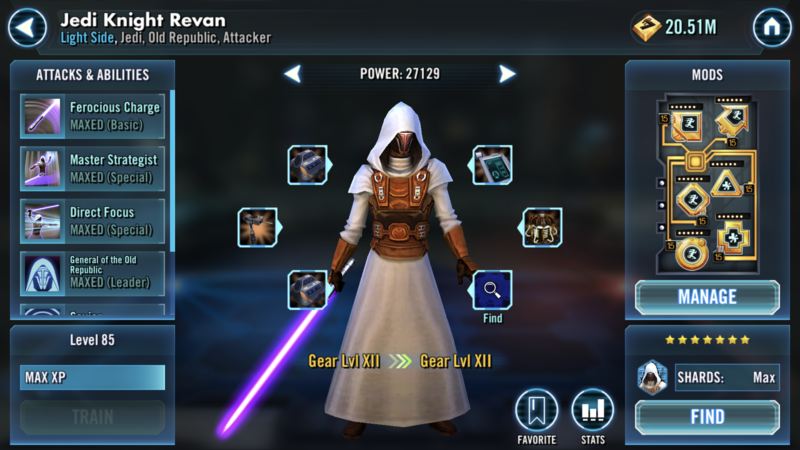 G12 3 zeta Jedi Knight Revan set on Light Side, Cantina, and Mod Battles. EDIT: Sorry guys, I’m all full right now. 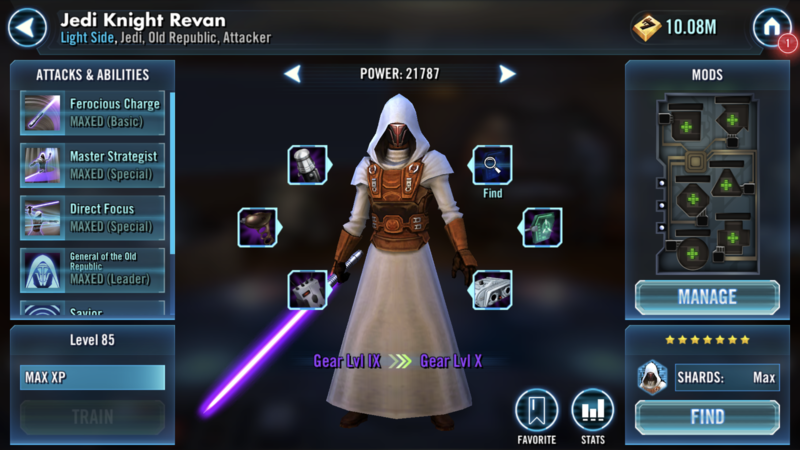 My Revan is G12+ 3 Zetas and 6 dot mods on all mod slots. Leader on all tables with 2 zeta Emperor Palpatine on dark side table. All full now I’m afraid!